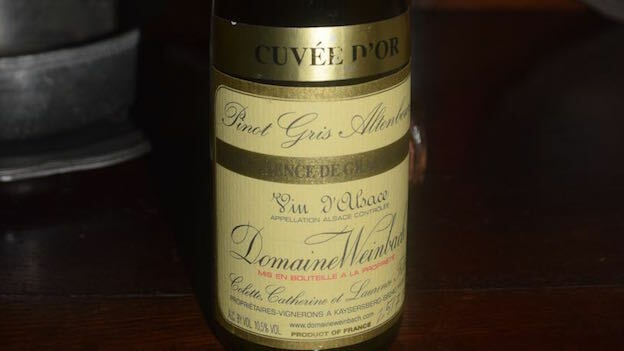 I have had an almost endless number of outstanding wines from Domaine Weinbach over the years, but the 2008 Pinot Gris Altenbourg Quintessence de Grains Nobles Cuvée d’Or is simply one of the greatest wines (white, rosé or red, dry, sparkling or sweet) I have ever tasted. This absolutely glorious late harvest wine was made from grapes brought in on October 24, 2008 from one of the highest sections of the Altenbourg, a lieu-dit that sits just below the Grand Cru Furstentum at roughly 220-300 meters above sea level (Domaine Weinbach owns 1.30 hectares in the Altenbourg, of which 25% is planted to Pinot Gris). The Altenbourg’s soil is very similar to that of the Furstentum, mainly marly-clay-sandstone, but with a slightly higher sand component, allowing for a slightly earlier harvest. In fact, when it comes to Pinot Gris (and Gewürztraminer), the Altenbourg is a grand cru in everything but name only, producing wines of uncommon concentration and depth coupled with uncanny grace and refinement. The 2008 Pinot Gris Altenbourg Quintessence de Grains Nobles Cuvée d’Or is luscious and sweet (197 g/L residual sugar and 10.62 g/L total acidity) and expresses the typical aromas and flavors of a late harvest Pinot Gris wine: honeyed quince, strawberry, mango, caramel and truffle but showcases utterly mesmerizing balance, depth and complexity. It’s an utterly unforgettable, magical wine. 100/Drink: 2018-2058.